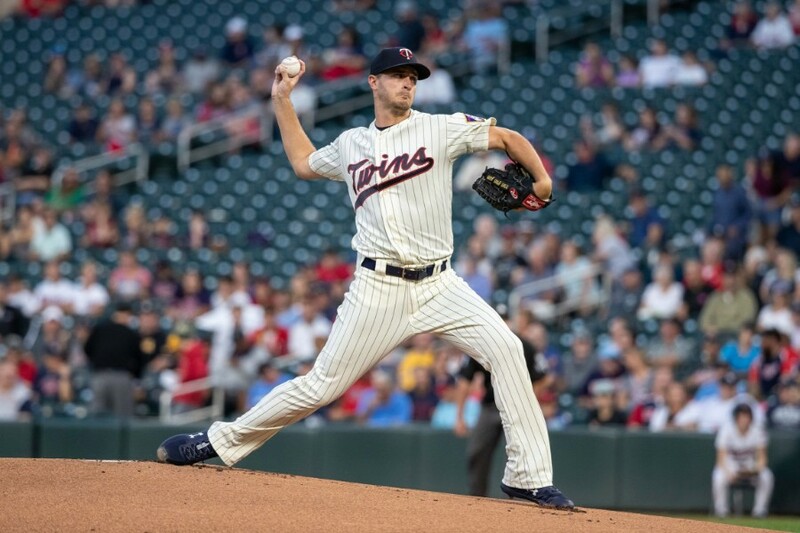 Jake Odorizzi provided both some excitement and some drama Wednesday night, taking a no-hitter into the eighth inning with an escalating pitch count. The bullpen started warming up in the sixth inning, but Paul Molitor allowed Odorizzi to see it through until the no-hit bid was no more. A solid double off the bat of Greg Bird broke it up with one out in the eighth. This was the first time all season Odorizzi recorded an out in the eighth inning, and he set a new season high for pitches in a start with 120. The only real big difference for him tonight was he threw his four-seam fastball a bit less often than usual. He typically deploys that pitch 54.6 percent of the time, but per Baseball Savant only went to it 51 times (42.5 percent). As is typically the case in any no-hit bid, there were some great defensive plays, including one from Odorizzi himself. Logan Forsythe and Robbie Grossman also made web gems while the no-no was intact and Max Kepler made an outstanding catch in the ninth. Luis Severino was looking really good himself tonight, holding the Twins to one hit through the first five innings, but the Twins finally broke through in the sixth inning. Max Kepler hit a one-out single and came around to score on an Ehire Adrianza double. The Twins added two runs off David Robertson in the seventh thanks to a hustle double from Jake Cave, a seeing-eye RBI single from Willians Astudillo and an RBI double from Max Kepler. La Tortuga hauling Astudillo scoring all the way from first made for one of the most fun moments of the entire season. Once Odorizzi was out, Taylor Rogers came in and struck out Gleyber Torres, then Trevor Hildenberger got Andrew McCutchen swinging to end the eighth. Hildy stayed in for the ninth and earned his sixth save. In the second inning, Mitch Garver took a hard foul ball off the mask and appeared to be dazed by the blow. He was checked on by the medical staff and stayed in to finish that inning, but was replaced in the third by Astudillo. Great outing by Odorizzi tonight. And the Twins beat the Yankees two games in a row. Love it. It's been awhile. I hope Astudillo is back next year. The Twins have had some fun players to watch run the bases over the years. Carew stealing home in '69, Greg Gagne and Cristian Guzan for their speed, and Buxton also. Then of course Eduardo Nunez and his helmet. But, except for Buxton, Astudillo takes the cake. Yes, I would agree that Astudillo has likely consumed more cake than well, probably only Buxton by now. The rest of those guys are much older. Odorizzi has been a rock this year and has taken the ball every time it has been his turn. Win or lose he has been a true pro all year. Twins dealt a blow to Yankees #1 wild card hopes. I hope they win every one of their remaining games against White Sox, Royals, and Tigers (they had better win most of them) but I do hope they lose to the A's so that Yankees have to go to Oakland for the wild card game. Maybe September can actually mean something after all. I love beating the Yankees! Wow, what a night for the arms! Astudillo!!!!!! That guy is such a breath of fresh air! He just ooooozes with effort, determination, fun, excitement and enthusiasm. He is exactly what this team needs so desperately to fire up his fellow players and the fans. He is a total keeper. Forget Castro and give the catching duties to Astudillo and Garver in 2019. It's always sweet to beat dem Yanks. It's sweeter to take a series. And it's even sweeter this time, because we gave 'em a little dent in the old Wild Card race! 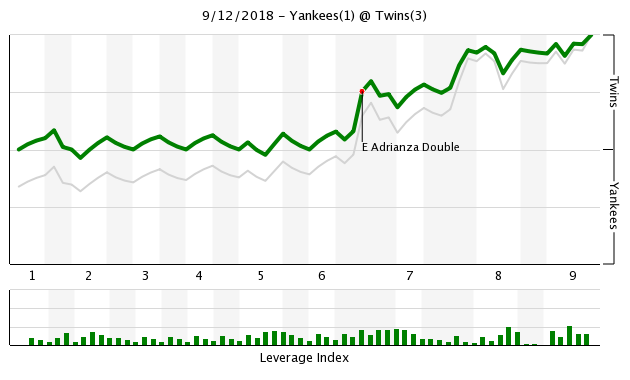 Odorizzi was clearly *completely* out of gas in the last at bat. I hope his arm is OK, he was shaking it a lot between pitches. This current Yankees team is good, but this is NOT the same team that dominated the Twins year over year. The lineup looked completely defeated midway through the game. The Twins will be able to beat these guys in the coming years if they get on track soon enough. I have been very critical of Jake Odorizzi for much of this season, and that criticism hasn't been misguided. Yesterday he stepped up in a big way against a very good team. I have long said the ability has been there, but the execution hasn't. It's only one start, but hopefully we see more of this Odorizzi for the rest of this year and into 2019. He is a big part of the Twins plans and for him to build on that for the next few starts would be huge. 3rd time through the order, Yankees were 1 for 7, with a double and a walk. That’s 2 good third trips in his last 4 starts. Looking through Odorizzi's stats at this point in the season, he is pretty much the same pitcher he's always been. Too many pitches, too many short starts, but satisfactory numbers for a guy in the back of the rotation. His walks and strikeouts are up, his hits per IP are down, but there are no dramatic changes. A contending team can send him out every five days, but they need to have three or four better guys, especially if the team wants to have "only" a seven-man bullpen. I read somewhere earlier in the year that Odorizzi broke some 100 year old record for number of starts in a year before recording an out in the 7th. However, that seems unlikely and I haven't been able to find the article since. For the record, it was 26 starts. If the "Opener" concept catches on, that record will be toast. I agree that this has been a disappointing year for Odirizzi but the facts are what they are. If you look at his career stats, this year has been an exception not the rule. I for one am glad he's still here and I hope he is for 2019 as well. Everyone would be happy to have him as a #4 or #5 starter.